The origins of academic regalia are obscured in history, but are believed to have originated in the 12th and 13th centuries. When the earliest universities were forming, the dress of a scholar, whether student or teacher, was that of a cleric. Typically, the medieval scholar would have taken ecclesiastical vows, and would have been tonsured. Long gowns were worn and may have been required for warmth in the unheated monasteries, where ancient texts were maintained. Hoods, and later skull caps, would have served to cover the shaved head. The wearing of distinctive regalia for universities consisting of a cap, gown and hood began in England. There, in the second half of the 14th century, the statutes of certain colleges prescribed the wearing of a long gown by faculty and students. Although originally attached to the robe, the hood subsequently became separated. The earliest hoods for undergraduates were a somber black and had no lining. Upon completion of a bachelor’s degree, bachelors had an optional woolen or badger skin lining added to their hoods. Graduates of higher degree and individuals of high birth had hoods lined with silk, sandal, or fur. Later, undergraduates abandoned the hood altogether, and the hood became the distinctive mark of having attained a college or university degree. Over time, distinctive colors were adopted by each discipline to distinguish them from their colleagues in other fields of learning. The tradition of special academic dress seems to have entered the United States through King’s College (now Columbia University) in colonial New York. As late as the 1880s, different institutions established their own academic dress codes similar to what is done throughout Europe to this day. For example, in 1886, both Yale and Harvard faculty were required to wear academic dress; and in 1891, Yale, Amherst, and Union seniors used academic outfits for the first time. Thereafter, the custom grew so rapidly that a commission was formed to draw up an intercollegiate code of academic dress. This code, with modifications made in 1959, remains in force. The costumes, colors, trimmings, and patterns you see are all traditional, and reflect both the degree and field of learning. Both bachelor’s and master’s gowns are untrimmed. Unlike the bachelor’s gown, which is designed to be worn closed and has pointed sleeves, the master’s gown can be worn open or closed, and has an oblong, open sleeve which hangs down in traditional manner. The doctor’s gown has bell-shaped sleeves. It may be worn open or closed. 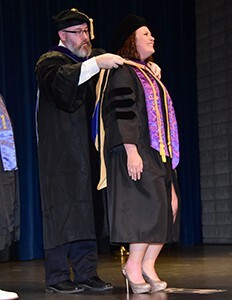 The facing and three bars across the sleeves of the doctor’s gowns are generally velvet and are either black or coincide with the color of the edging of the hood. The colors you see in the hoods and gowns represent the various fields in which the degrees were earned. The mortarboard or square cap, as we see it now, originated from the joining of the elements of a bonnet and a skull cap; as early as 1600, Oxford University scholars began using lightweight boards to hold out the corners of their bonnets. The tassel, worn on the left of the cap, may be gold if the holder has a doctor’s degree. 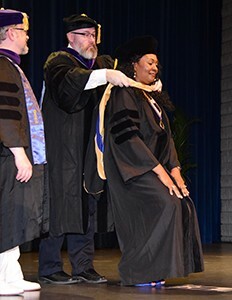 The Hooding Ceremony at Atlanta’s John Marshall Law School signifies a scholarly and personal achievement. 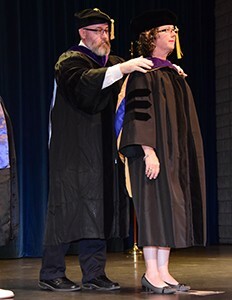 The Associate Dean of Student Affairs calls forth the Juris Doctor candidate and the Associate Dean for Academic Programs places the hood on the student as a symbol of passage from student to “doctor.” Among the first to recognize this rite of passage is the Dean of the Law School and the Chairman of the Board.